One advantage to finding out about a game later in its life (assuming, it’s any good in the first place) is that plenty of people have written about it. Long Live the Queen is no exception here, and I will link amusing tales by journalists and bloggers I’ve come across. Eric Vanderveer – Who finds out what happens playing an angry, paranoid princess. The Mary Sue – In which a pink-hating girl journalist games like an admin analyst and makes me laugh. Lady Geek Girl – who compares LLTQ with Princess Maker and thinks about what lessons the games are giving out. Paul Tristan Fergus – who takes the game extremely seriously and pronounces it the birth of high art within computer gaming (?). Cheratomo – Who laments the lost opportunities during his her many playthroughs. In the meantime, I’m still identifying important events. The very first skill check you have is composure, to see if you will hold still when the milk viper is at your feet. All you need is a skill of ten. Even with the -1 penalty you get on the first week, this is doable with two classes. If you can hold still, Charlotte and her family will still leave. Whether this is important or not during the story I haven’t found out yet. The Chocolate Death seems to feature numerous ways to avoid it – including poison (naturally), dog handling, various intrigues and courtly skills. I should catalog a list. Visiting your long-lost friend (why is she writing me ?) includes an assassination attempt you had better be ready to avoid. The invasion seems to require a high skill in naval combat to fight off well. If you don’t, don’t fret – a magic using duel may evolve. Preparing for either of these two eventualities is probably required to survive. I didn’t need to do much after that and my only win in the game. Long Live The Queen is an anime story-telling type game with a twist – the main character has skills you need to increase in order to survive. The goal is to live long enough to become queen. Or just fail and find out how many ways the developers have to kill a 14 year old girl. Hat tip to Stephanie, who made me aware the game exists and that it’s fun. Naturally, I had to buy it immediately. It’s been done before. I remember vaguely in the late 90’s, postings on Ars Technica led me to some similar game where you needed to guide your princess and teach her enough to grow up well. 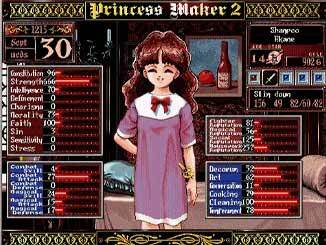 Ah – Google found it – Princess Maker 2. After having a ball with this, and forgetting about it, as soon as I heard about a new version I absolutely had to have it. I had almost forgotten about this one. The gameplay is simple. Follow the story, and choose various skills which are all helpful. Survive long enough, and well enough, to become queen on your birthday. Each week there is the possibility of some event happening, which you either have to survive or will somehow affect the gameplay. 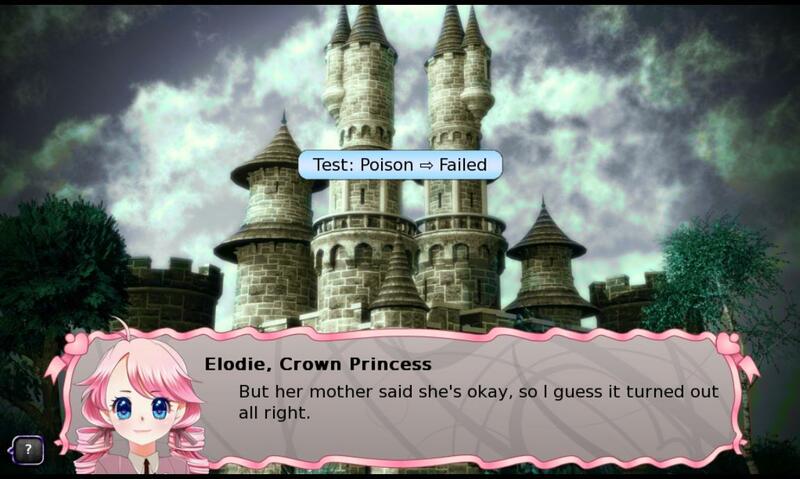 I have missed a poison check there. It seems the game is not too hard to win – a few reloads, and I won my third game. Still, this is a fun little timewaster and may be good for the kids. I got my boy to try it last night, I’m not sure he’s crazy about it, but anything that includes reading I try to expose them too. Any game’s key is, if you don’t want to stop playing it. Last night anyway, this had that feature.